Built-in quiet graphical thermal printer. Rechargeable Lithium Ion battery runs about 12 hrs before needing to be recharged. Large touch tone screen with signature capture via supplied stylus and signature print. The Verifone Nurit 8020 is the latest improvement of the Nurit 8000/8010 line of handheld payment devices with upgrade security and PCI compliancy. Its an all-in-one device meaning the pinpad and printer are all built-in and there is no need for these auxiliary components. 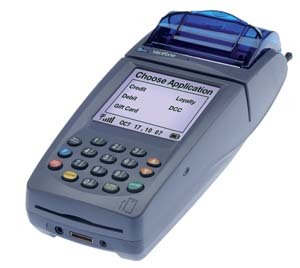 Its a robust unit for the on-the-go merchant who needs to be able to process credit cards at multiple locations. The Nurit 8020 is built on a proven platform and is a small compact (small footprint) wireless terminals that is very reliable and very popular.